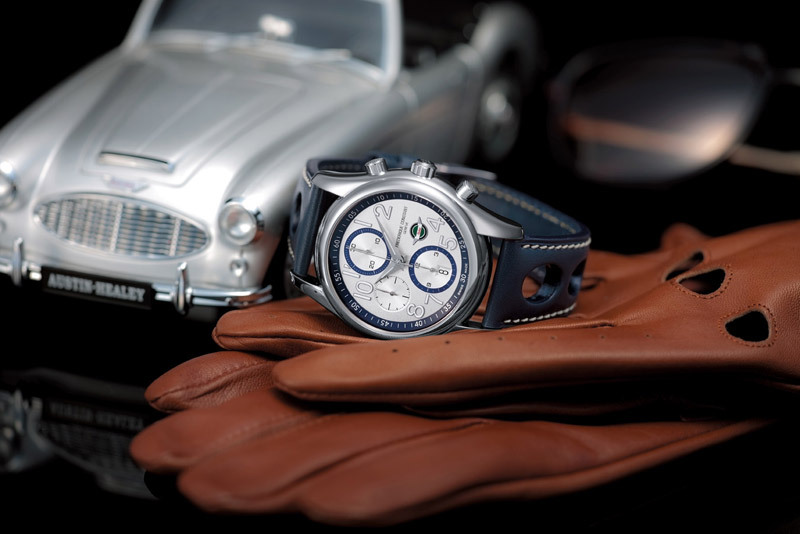 Frédérique Constant New Healey Chrono-Automatic: The passion continues…. 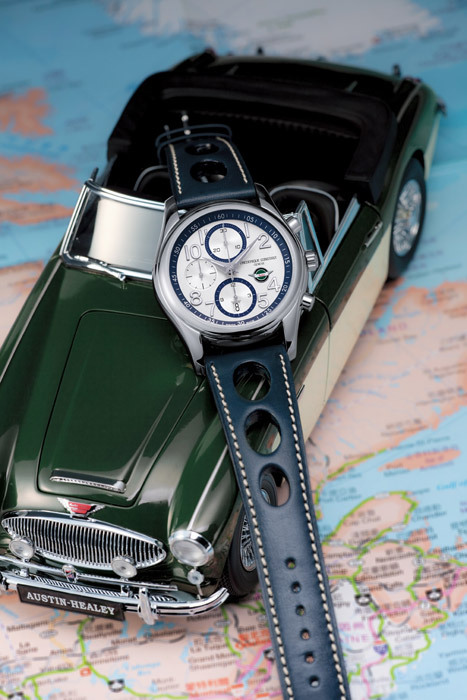 As everyone knows, the story between the Swiss Watch Manufacturer Frédérique Constant and the Austin Healey Cars is a story of passion. After having been the Official Timing partner of the 2nd European Healey Meeting in St. Moritz in 2004, the Dutch Healey Anniversary in 2005, the Healey Le Mans Challenge in 2006, the Healey Challenge Heidelberg in 2007 and the 3rd European Healey Meeting last year in Sweden, Frédérique Constant is proud to announce its new sponsorship of the 34th International Austin Healey Conclave 2009 organized by the Austin Healey Clubs of America and Canada. A unique event, which will reunite over 300 Austin Healey sports cars dating from the 1950s, and more than 600 enthusiasts from around the globe. These Healey enthusiasts will drive and race together from June 21st to 26th in the area of Kingston (Ontario) in Canada to celebrate their passion for the Austin Healey cars. During one full week the attendees to the event will enjoy numerous activities. Track races, a Concours d’Elégance, rallies and the discovery of the exciting Canadian countryside are all part of the program. And all this, actively witnessed by three particularly honored guests: Mr. John Sprinzel, Mrs. Ann Wisdom and her husband Mr. Peter Riley. Mr. John Sprinzel is synonymous with the great Sebring Sprite racing cars and was a BMC – “British Motor Corporation” race and rally driver in the 960’s. Moreover he is the former owner of John Sprinzel Racing Limited. John has written a book called “Spritely Years” and is an entertaining guest speaker. Mrs. Ann Riley-Wisdom: is one of the most successful Healey navigators in the history of the brand. Debuting in the 1957 Italian Sestriere Rally with the first 6-cylinder rally car type UOC741. Ann was the successful navigator to Pat Moss in international rallying. Ann and Pat won many trophies including outright victory in the 1960 Liege event and a Class win in the 1960 Alpine Rally. She also took part in the 1959 Canadian Winter Rally with Pat Moss. Mr. Peter Riley is a former BMC Works rally and test driver. Peter chalked up the Healey 3000’s first International Class victory in the 1959 Liege-Rome-Liege rally and drove UJB143 (now DD300) with Jack Sears at the 1960 Le Mans. To celebrate the continuing sponsorship of the “Healey Challenge Canada 2009” in Kingston, Ontario, Frédérique Constant introduces the new “Healey Chrono-Automatic”, issued in a limited edition of 1’888 numbered timepieces. Presented in steel, the rounded case with a diameter of 43mm is hand polished and features an elegant silvered dial with blue accents. The large numerals with blue outlines guarantee a clear readability thanks to their luminous finishing. 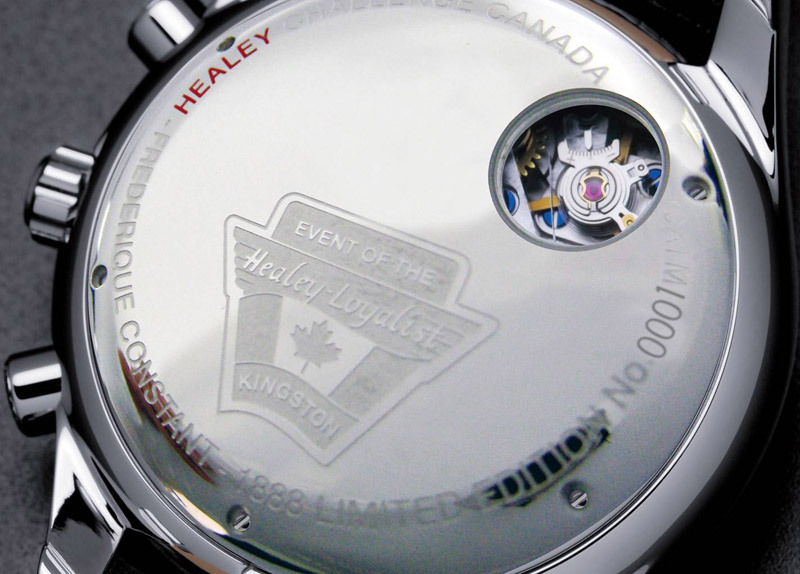 As a subtile hint to this “34th International Austin Healey Conclave – Kingston 2009”, the official logo of the event is engraved on the case back, and an aperture offers a glimpse of the automatic movement. To emphasize on the special value of this timepiece, it is delivered in a luxurious wooden gift box that offers a miniature duplicate of a Healey Car, type 100/6.
. Convex sapphire crystal, See-through case back secured by 6 screws. Austin Healey Conclave – Kingston 2009 Logo engraving on the case back.